Those of you who have been following this series of posts, beginning with A Model of Retirement Planning, Part 1, know that in my last post, A Mission Statement for Retirement, Part 5, I borrowed a mission statement from the strategic planning process for businesses. I tweaked it a bit so that in the retirement plan context it explains what we hope to achieve with a retirement plan. But, as a famous financial planner who attended the London School of Economics once informed us Boomers, “You can’t always get what you want.” To put it simply, our ability to achieve our financial desires in retirement are constrained by the state of our household’s financial resources and the outlook for the economy. 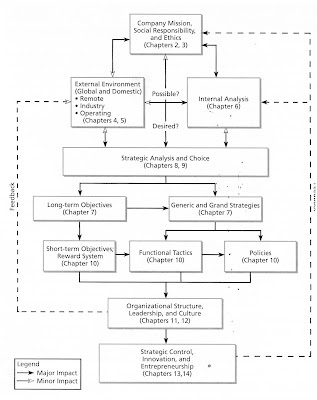 The strategic planning process for businesses proposed by Pearce and Robinson explains that the correct choice of business strategies lies at the intersection of “what is possible” and “what is desired.” The proposed strategic retirement planning process has different blocks than Pearce and Robinson's for businesses, but the principles are quite similar. Their diagram looks like this (click to enlarge). The possibilities for a business’ strategic choices are bounded by the external environment (competitors, regulators, etc.) on one side and an internal analysis (the company's strengths and weaknesses) on the other. The internal analysis is essentially a review of strengths, weakness, opportunities and threats, commonly called a SWOT analysis. The company mission statement identifies what the company hopes to achieve. An analogous strategic retirement planning process also needs to find its strategies at the intersection of what is possible and what is desired. In our case, the external environment is essentially the economy and it includes those factors that affect all households (“systematic” factors) – the realm of game theory’s “nature” – such as capital markets, changes in tax laws, changes to the Social Security program, interest rates, changes in our health care system and health insurance availability. Having “longevity genes” is an internal financial weakness because it increases the odds of a long, expensive retirement. Having lots of children and grandchildren who may need our financial help is a weakness. Having under-saved for retirement is a weakness while having over-saved is a strength. Financial expertise is an obvious strength while the lack thereof is an obvious weakness. Having a job you can keep, or perform part-time, as you age is a strength while employment as a construction worker might be a weakness because your profession might be limited by age and health. Opportunities and threats are external to the household. Political movements to limit Social Security benefits are external threats to your retirement finances. The current and future capital markets can be opportunities or threats; the current low-interest rate environment is an external threat. Sequence risk is an external threat, as is inflation. These external or "systematic" factors would impact everyone’s financial situation regardless of their household’s strengths and weaknesses. In retirement planning, we typically think of financial risks. Weaknesses are our internal risks; threats are our external risks. The challenge of retirement planning is to find a strategy (and there may be several) that meets the desires of our mission statement but also falls within the limits imposed on us by the economy and our household’s resources. The benefit of a strategic plan is that it focuses priority on meeting the most important financial goals of retirement (maintaining standard of living, avoiding bankruptcy, leaving a legacy, aging in place, etc.) and relegates the technicalities, such as asset allocation, safe spending rates, insurance and tax management to a supporting role. Good retirement strategies are found at the intersection of what's desired and what's possible. If there is no reasonable strategy to be found, we will need to create a more modest mission statement that is more about what we need than what we want. The creation of the mission statement and strategy selection are an iterative process through which we create a mission (our goals) and then determine if we can develop an acceptable strategy to meet that mission. If we cannot, we create a more modest mission statement and repeat the process. On the upside, strategy selection might also show that our mission statement was initially unnecessarily conservative, in which case we can increase its scope and search for strategies again. I would argue that Mick, for example, has probably ended up with more than he initially wanted and could upgrade his expectations, though I concede that having too much success is a poor starting point for a good blues song. Having discussed the mission statement in my previous post, we need to add two more lists to our plan: an assessment of the economy and an assessment of our household resources. An assessment of the external environment, the economy, will include our estimate of future market returns, inflation expectations, tax expectations, and interest rate expectations, for example. We also need to add an internal household wealth analysis, using wealth in the broadest terms to include human capital and knowledge, that identifies our resources for funding retirement. I have listed some possible contents for the mission statement, analysis of the economy and household wealth analysis here. Once the mission statement, assessment of the economy and household wealth analysis are complete the real planning can begin. (Until now, we have only defined our goals and the constraints for a plan.) This is where the skill, experience and knowledge of a good retirement planner come into play because this is the point at which we must imagine a retirement income strategy that meets our mission objectives within the constraints of what is possible given our wealth and the current economy. It will be difficult to accurately assess the probability of success for each acceptable strategy, so we should select a strategy from this best strategy set without trying to narrow down the best individual strategy. The selection of one from among these many may depend on individual preferences. For example, we may find a strategy that uses annuities and one that does not, both with about equal probabilities of success. Some retirees will prefer the former and some the latter though both meet the strategic objectives with similar risk. This may sound like a planner should imagine several good strategies and work with the client to select one, but that would be an inefficient approach. Instead, the planner should make her best efforts to identify a single strategy within the best strategy set. The strategy can then be reviewed with the client to determine if there are aspects of the plan with which the client is uncomfortable. The planner can then suggest alternatives and verify that the new candidate plan indeed falls within the best strategy set. 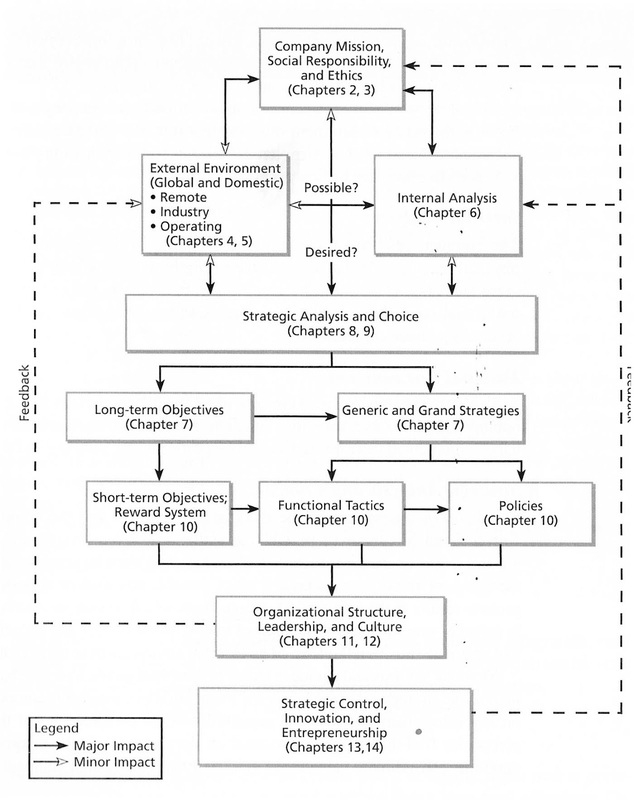 The planner may also explore possibilities within the best strategy to improve on the current strategy selection. The last step of the creation of the initial retirement plan is to establish objectives by which the plan’s progress can be measured over the coming year. To review the high-level process of strategic retirement planning as proposed, the steps are as follows. 1. Household develops a Mission Statement explaining their strategic objectives for retirement. 2. Planner works with household to identify retirement resources (RIIA refers to this as the “household balance sheet”) including internal strengths and weaknesses. 3. Planner provides an analysis of household wealth and an analysis of economic outlook for key variables. 4. Planner searches for a strategy that meets the objectives stated in the Mission Statement within the constraints of the economic outlook and household wealth analysis. 5a.) If no acceptable strategy is found, planner and household review and reduce the scope of the mission statement and planner repeats step 4. 5b.) If the scope of the mission can be met and unallocated resources remain, planner and household review and increase (if clients desire) the scope of the mission statement and planner repeats step 4. 6. Household reviews the strategy for possible concerns. 7. Planner reviews the strategy for possible improvements. 8. Planner develops objectives by which the plan’s progress can be measured over the coming year. Of course, you might be both the planner and the client. If I appear to dismiss the complexity and challenge of step 4 for many households, during which the planner searches for suitable strategies, that is not my intent. This is clearly the step in which retirement planning training, skill, and experience are brought to bear. The strategic approach is intended only to place the search for a retirement income strategy within a strategic framework to better define its objectives and constraints. You may be asking yourself how this approach is different than other retirement planning processes. Why not just sit down and try to make all the pieces fit into a workable plan? First, it's a better process because we get a better answer when we ask a better question. Second, strategic planning focuses on developing a top-down strategy that begins with your most important retirement goals and the major constraints on meeting those goals. Tactics are addressed only as the means to achieve strategic goals. The choice of asset allocations, for example, is considered within the context of the entire plan and not on its own merits. The top-down strategy is important when we consider that nearly every tactical decision we make in retirement planning affects most other aspects of the plan. For example, selecting a sustainable spending rate independently because we are comfortable with the resulting probability of depleting our savings portfolio has other ramifications. That decision may also affect (or be affected by) our asset allocation, our floor strategy, our estate plan and even when we choose to claim Social Security benefits. And, finally, strategic planning provides a framework for identifying the best strategies, those that have the best chance of meeting our mission within the constraints of our household’s wealth and those of the economy at large. The best retirement strategies will come from envisioning the big picture first. To summarize, start your retirement plan by identifying the major goals you hope to achieve with a mission statement. Identify the limitations imposed on all of us by the economy and the limitations imposed on us individually by our financial situation. Then search for a strategy with a strong chance of achieving your mission within the constraints you identified. (You may want to work with a good planner on all of these.) Repeat annually, because over time it is likely that your household finances, the economic outlook, and even your retirement goals will change, perhaps dramatically. The best retirement strategies, just like the best business strategies, will come from envisioning the big picture first. See how this all plays out in The Retirement Plan I would Want, Part 7. Let's take a quick review of the story so far. Retirement finance is, in game theory terminology, a sequential game against nature (see A Random Walk, A Sequential Game, Part 3), nature being a "fictitious player having no known objective and no known strategy." We place our bets, as in a game of roulette, and nature spins the wheel. Then it's our turn again and we reassess our situation and place the next set of bets. Our wealth throughout retirement will look like a random walk because most of the key factors of retirement are probabilistic (see A Model of Retirement Planning, Part 1). Wealth will meander from its initial value at the beginning of retirement between increased wealth and insolvency. Our wealth at all states (ages) of retirement will look like a time-discrete Markov chain because our wealth at our next age depends only on our current wealth and what happens in the coming year. In other words, if we have $1 million today, it doesn't matter if we got here beginning with $2 million or beginning with half a million. Our past finances are largely irrelevant. Retirement finance also appears to act like or to be a chaotic system and whether it can be mathematically proven to be chaotic probably doesn't matter. (If it looks that much like a duck, it's wise to cover your head when it flies directly over you, see Retirement Income and Chaos Theory.) Our finances can enter positive feedback loops that will end in bankruptcy for about one in two hundred retirees, insolvency being a far worse outcome than the depletion of our savings portfolio alone (see Why Retirees Go Broke). In simpler terms than those of statistics and probabilities, game theory and chaos theory, retirement finance is highly uncertain (risky), requires periodic adjustments and the bottom can fall out frighteningly fast. This brings us to my last post, What Would a Good Retirement Plan Look Like?, in which I suggested that a good retirement plan is one that has a high probability of successfully meeting a retiring household's achievable objectives. If we accept this as the definition of a good retirement plan, then the next obvious question becomes how we define and integrate the goals of the household into the retirement planning process. Goals and objectives can be strategic or tactical. Strategic goals are what we want to achieve. Tactics are how we will achieve our goals. Successfully funding our standard of living for the remainder of our lifetimes is a strategic objective. Maximizing the household's inheritance might also be a strategic objective. Selecting an optimal withdrawal rate or asset allocation are tactical objectives. One way to distinguish between the two is to consider whether you would measure retirement success by achieving that objective. If you were to constantly maintain the optimal sustainable withdrawal rate throughout your retirement but fail to maintain your standard of living, you would probably not consider retirement a success – it would fail the "Saint Peter test”, a thought experiment I described in What Would a Good Retirement Plan Look Like? Maintaining an optimal sustainable withdrawal rate throughout your retirement, then, is not a strategic objective but maintaining your standard of living is. I expect that most people wouldn't consider owning a life annuity as an objective in itself, though it can be an excellent tactic for achieving the strategic objective of not running out of income before you die. Likewise, implementing a floor-and-upside strategy is not a strategic objective, but a tactic to achieve a broader goal. The point of all this is that a retirement plan should aim to meet our strategic objectives and that tactics are just a way to get there. Tactical objectives should follow from strategic objectives. The best model I have found for a strategic retirement planning process is the one used by businesses. Although there are significant differences between developing a strategic plan for a business and developing one for a household's retirement, the overall process for the former seems a good model for the latter. A good retirement plan should begin with a mission statement explaining what you hope to achieve. The strategic planning process for businesses begins with a mission statement. That seems like an ideal place to begin a strategic retirement planning process, as well. While businesses use the mission statement, according to Pearce and Robinson, "to describe the firm's product, market and technological areas of emphasis . . . in a way that reflects the values and priorities of the firm's strategic decision makers", retiring households can employ a mission statement to identify their strategic objectives, or those things that, at retirement's end, they would need to have achieved in order to consider their retirement to have been successful. While we are primarily discussing retirement finance, a mission statement should also include important strategic objectives that may impact our finances, like wanting to travel or earn a Ph.D. In fact, once we achieve the required state of intense pondering required to create a mission statement, it wouldn't hurt to throw in some non-financial but important goals like figuring out the true meaning of life or becoming a blogger. Here's an example of a retirement mission statement. We hope to maintain our current standard of living throughout both our lives, though we recognize our spending desires will likely decline some with age. We don't want to be a burden to our children. We plan to pay for our children's education as far as they are willing to pursue it, but we have no fixed plan for an inheritance. We are not willing to risk our current standard of living to improve it or to increase our terminal wealth. Our standard of living is our priority. We want to travel abroad every year until our mid-70's. We prefer to downsize our home by age 75 to reduce maintenance. Your statement can be longer or shorter, but it should at least encompass your feelings about risk, standard of living, plans for your home, and bequests. Notice it doesn't mention sustainable withdrawal rates, asset allocations, annuities or floor-and-upside strategies because those are tactics and not strategic objectives. If you are setting out to develop a retirement plan, I recommend you create such a mission statement as the starting point. Satisfying this mission statement is the goal of your retirement plan. If you are about to pay someone else to develop a plan for you, the mission statement is a great way to communicate what you expect from the plan. A mission statement can help you and your spouse make sure you're on the same page. And if you already have a plan, I recommend you develop a mission statement, anyway, and compare it to the plan you have. Make sure your existing plan is set up to achieve your strategic goals. Your first draft of the mission statement may not be your last. You may remember from a previous post that we amended the definition of a good retirement plan to define goals as reasonable (attainable). During the planning process, we may discover that some of the goals of our mission statement aren't achievable given our resources, in which case the mission statement must be revised. On the plus side, we may discover that there are resources available to enhance the goals in the mission statement. But, figuring that out comes next at The Intersection of What's Desired and What's Possible, Part 6. In my three previous posts, beginning with A Model of Retirement Planning, Part 1, I laid out a high-level model of retirement finance. The high-level model essentially describes the problem we are trying to solve. But, my ultimate goal is to define a good way to develop retirement plans to solve the problem. Surprisingly, I have been able to find very little literature that addresses the best way to develop a retirement plan. As I have mentioned before, RIIA’s approach is the best I’ve seen but it is still a little too tactical for me. A good place to start, I think, would be to decide what a good plan should look like in broadest terms. When answering questions like this, I try to imagine myself at the future endpoint looking backward. For example, when I make a major decision, I imagine that it has turned out badly and that I have asked myself what I would decide if I could have a do-over. Would I ask myself why I had taken such a bad risk and vow never to make that mistake again? Or, would I believe I had made the best bet and just been very unlucky? In the latter case, I’d make the same decision again. I try to avoid the what-was-I-thinking outcomes. I find this approach especially helpful when I’m considering a bet with a low probability of a really bad outcome. It's so tempting to imagine that low-probability outcomes, especially the awful ones, just won't happen. But, improbable doesn't mean impossible. Since most of retirement finance is probabilistic, a retirement plan is essentially a bet. I try to avoid having to one day think, “That bet was a huge mistake, but it seemed so unlikely that I’d lose it.” Going broke late in life is one such bet. My first thought was that we should evaluate our plan by how well it met our individual household goals (past tense – remember, we’re standing at the gates), but that doesn’t take risk into consideration. A retiree who successfully funds retirement by investing 100% of her savings in penny stocks didn’t have a good plan, she was just extremely lucky. Lots of people successfully fund retirement with no plan, at all. So, retirement plans can’t be measured solely by the eventual extent of their success. A good retirement plan, viewed in retrospect, would be one that had a high probability of achieving the individual household’s retirement goals. In other words, it was a good bet. Retirement finance is a stochastic (probabilistic) game, so retirees can win with a bad plan and lose with a good one, though we would expect that to be less likely than the reverse. A good plan is a good plan whether it succeeds or fails. A bad plan (or no plan) is a bad plan even when it succeeds.